Our Tree Rope Bags come in three sizes: Medium, Large and Extra Large. Our Rope Bags are made to the same High Standards as our Picking Bags and use the same Material. Heavy Duty Grommets are used for the Rope Opening. 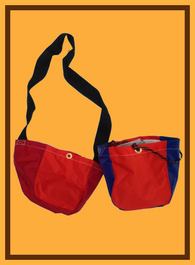 Rope Bags come in two versions: the first has a neck strap and the second version has a waist strap.